See you later alligator.... ehr, um... aligote. Francois Mikulski, Aligote, 2004? 2005? 2006? Vintage subject to change without notice! $13-$16 depending on the vintage. The Cheese Store of Silverlake has had great luck selling this wine, a Veritas selection. It has one or two loyal followers anyway. It is produced from old vines, planted in 1929, which produces wonderfully concentrated lemon / lime fruit. Its SUPER high in acidity and no oak on this baby. It's steely and refreshing and perfect for hot summer days. Someone told me on Monday its like drinking razor blades. Now that's my kind of wine! In other news, I feel terrible today. Am blogging from bed. Hope its not the Swine FLU! Either that or too much Fleurie last night - stayed tuned! We knew we were drinking this wine too young, but we drank all our everyday wine and had nothing left except more pricey stuff that we bought last year. It was indeed very good, but the fruit is so sweet it sort of obliterates the structure, if that makes any sense at all. This would be much better in 5 years, but alas we have done drunk it all. So I propose that you head over to the Wine House, buy a bottle for $59.99 and sit on it for a few years. Then invite me over so I can try it again. Any takers?? One day about a month ago Peter and I were out selling wine. It was one of those days where I didn't sell any wine. He sold about 2 cases of wine. And while we were lamenting my bad luck, we passed this guy. And now I look at this picture frequently, especially when I feel really bad, and just think to myself, it could be worse. You could be wearing a really dirty faux superhero costume, eating a rotten apple (its hard to see that from this picture), have a 6 day old 5 o'clock shadow (that would be really embarrassing for me) and holding an arrow larger than your body. On the flip side, I really want to iPod my car. Now I know where I can do that. Now, for me, this wine was weird to see! We see the Crozes-Hermitage all over the place in So Cal, but St.-Jo from Graillot (wow, that rhymes) is something new and interesting! The truth is I don't think you can get it down here, but it was exciting, so I wanted to write about it. Now, I consider this a more modern style wine, which I like from the Rhone. Of course, I like all styles from the Rhone, but sometimes something with a little more fruit and a smidgeon of oak makes me very happy and this did just that. The fruit are very red, red currants, deep raspberry and framboise flavors and some sweet tobacco. Ah! Takes me back to the old days in Kentucky when I was growing up. Reminds me of grandpa. Or rather it would remind me of grandpa if he smoked a pipe, but he didn't so it reminds me of a grandpa that smokes a pipe in Kentucky, but not my grandpa. Another side of the Loire. Yum, yum, summer fun! And I know what you're thinking, another Loire red?? Yes, but this time at least its Pinot Noir and not our good friend Cabernet Franc. I do like to mix it up a bit. Sylvain Bailly, La Louee, Sancerre Rouge, 2006. There is not a lot of fruit in this wine, it's pretty sparse, but what it does have is what i just love for summertime, lots of minerality and loads of acidity. it's so light and refreshing, and it evolves really beautifully in the glass, taking on more dried herbs and savory notes as it gets more exposure to air. I will say, this isn't everyones cup of tea, but it sure is mine! Rosso Wine Shop for $21.99. Chateau de la Negly, La Falaise, Coteaux de Languedoc, 2006. When Peter and I drank this wine he said, "This is the sort of wine that scares you as a syrah producer, because its so good, and the price is unbelieveable"
And indeed he is correct. It has smoky, meaty, gamey notes, but great black fruit concentration and moderate, very balanced tannins. It is simply the best Syrah I have had this year. And it would be perfect for my friends Rebecca who Peter, who love different styles of wine. It has old world qualities for Rebecca and new world qualities for Peter. It's the perfect wine at the perfect price. It's on sale now for $19.99 at K&L in Hollywood. Like Barolo in a spoon, but not really. I know this seems to have nothing to do with wine, not directly anyway. But I think that indirectly it has everything to do with wine. I love Yogurtland at LaBrea and Beverly! And I'm not the only one. It is PACKED every time I drive by. Like people out the door even when its windy and cold. People of all ages and sizes. I don't get it. But I mean, I do get it. I actually REALLY get it. I want Yogurtland everyday. I know its just frozen sugar and I'm not really into things like this. But I can't help myself. And I want to be clear - I don't get it the healthy way - with fruit or anything. I hate fruit for the most part (weird, huh? Who hates fruit?) I get Arctic Vanilla swirled with Dutch Chocolate and I put ground up Butterfinger and Snickers on top with sliced almonds and chocolate chips. It's delicious. If they made a Yogurtland flavored wine it would be my favorite, especially at 30 cents an ounce. Oddly, I always seem to spend exactly $2.72. Amazing how consistent I am. It's a true pleasure in life. Kinda like Barolo. And that's how it's like wine. Pierre-Marie Chermette, Fleurie, Les Garants, 2006. The wine is way better than the picture. I just love GREAT Cru Beaujolais like this as much as I love Chinon and Loire Cab Franc. This is the opposite of Nouveau - as you pros know - its not uber complex - but full of ripe cherry fruit, high acidity and savory dried herbs. Yum-o-rama! Perf for summer outside in the sun, chillin with the hubby and the bubby (That's Bubbles the dog). Chateau Beau-Sejour Becot, St.-Emilion, 2004. If there's one thing I like Bordeaux it's an off vintage! I am not a fan of the vintages that everyone else loves, mostly because I drink young wine and these lesser years are less expensive and more drinkable when young. This was a tasty one - lots of soft plummy fruit (hello Merlot!) and soft integrated tannins. Nothing green or under ripe about this wine. Muy delish and I am not Bordeaux lover, Lover. Ok?? I think we got this at the Wine House for around $30, but I have to check with Peter on that, will get back to you. Ok, I LOVE Barolo. I mean, for me it would be a hard choice if I had to pick between Bonnes Mares and Barolo to drink for the rest of my life. But Barolo, particularly this Barolo, is so spectacular for the money. There aren't a lot of GREAT Burgundies out there for $45. That's like a Village level retail price. The Grand Crus are sooo expensive. I actually drank both Musigny and Bonnes Mares at dinner last night (Vougeraie 2006) and they were spectacular, but I certainly can't afford to drink them. And then, of course, they were way too young. Some might even say that drinking this wine, a mere 2004, is too young, but it had so much depth and texture I was just over the moon. We drank this when I was having a particularly bad day. Pete surprised me. I blind tasted and knew immediately - ahhhh! Barolo!!! Nothing else like it. $44.99 at the Wine House and worth every GD penny. F.X. Pichler, Riesling Federspiel, Urgestein, Terrassen, Wachau, Austria, 2007. Say that 5 times fast. No really, try to say it just one time slow, it's still impossible. I love Pichler, but like so many German wines (yes, I know this is Austrian), I just can't imagine the average consumer picking this up and saying, "Wow, this wine looks just delicious, let's have that for dinner for tonight!" The Smaragd / Federspiel / Steinfeder is a whole 'nother classification system to learn, and I just don't really WANT to learn another one. It's just too much. Basically, in case you don't know, wines from the Wachau are classified according to their "must weight" or how ripe the grapes are at harvest. There are 3 levels. Smaragd is equivalent to Auslese, Federspiel is equivalent to Kabinett and Steinfeder is equivalent to Qualitätswein. That assumes, of course, that you know the German Pradikat system, which means even more confusion to the consumer. AND that, naturally, these wines are totally dry, so its essentially, a dry Auslese / Kabinett / QbA. I know those of you who know wine will be bored stiff from this post, but I'm just trying to be educatory. Ha! This wine $35.99 at the Wine House. I recently started writing for Edible LA, my first submission will appear in the summer issue, so I thought this would be a great contest to enter. See the instructions and details below! Ever dreamed of going fishing with a famous chef and having him prepare the catch? That dream could become a reality if you win our contest. . .
With the boat booked--and the date set, April 21, 2009--Michael then invited a few of his chef friends along for the ride. Too many chefs spoil the broth, and all that, but hey, the more the merrier on the high seas! Oh, the responsibility of taking the creme de la creme of LA food talent out on a boat to fish the local waters! "You're gonna need a bigger boat." Who better to write our story than esteemed poet/chef/writer Amy Scattergood? She enthusiastically signed on to fish with Michael, having once referenced in an article she wrote his knot-tying skills gained from fishing. Enter before midnight on April 16, 2009. The winner will be drawn at random. If you win you will be notified on April 17 via email. Don't forget your sea legs! Remember that 70's TV commercial? Well, not Chinese, per se, but a retail trade secret is: wineries move from distributor to distributor often. And when that happens the previous distributor has a decision to make: sell off wines at a discount to move out the old product that they will never have again, or, keep pricing the same and potentially sit on the stock for a while, since they will not be actively promoting it. Distributors always choose the former so that they can generate cash flow. This is good for retailers and consumers alike but it also creates a situation where the brand can be damaged. But I feel that in most cases consumers' short-term-memory mitigates that risk. So finding a discount one day and not the next will not kill the brand, but instead, potentially expose people to a new wine. In this way, the temporary lower price can ultimately build the brand, long term. Case in point, Arcadian. This Rio Vista single vineyard Pinot Noir has a suggested retail price of around $65. But because of an innocent switch in distribution we were able to buy it and offer a price of $49.99. Now $50 is expensive for a bottle of wine but with a this kind of discount, maybe someone will try an Arcadian wine for the first time and become a convert. We have been fans since the late 90's. Joe Davis, winemaker of Arcadian, has been making wine under his own Arcadian label since 1996. His wines are distinctive and ethereal. 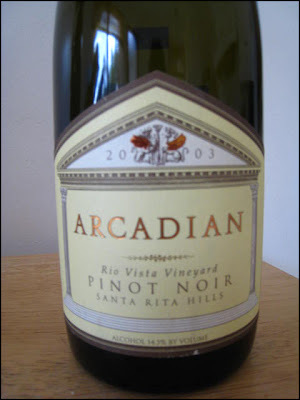 This six-year-old wine, the 2003 Arcadian Pinot Noir Rio Vista Vineyard, is a fantastic bottle of wine. The first thing you notice is the translucent color. You can see through it. One would guess that there is no fining or filtration as the brickish color remains a bit cloudy. Upon first sniff there are rich aromas of red fruits like raspberry, cherry and some spice notes. On the exceedingly silky palate there are loads of ripe red fruit that is sweet but balanced by lavish tannins and a good bit of acid. It is this acid that makes these wines great partners with food. On the finish you have layered notes of cola and earth. A really great bottle that I am happy to pimp to the nearest Pinot buyer. La Fenetre, Syrah, Santa Barbara Highlands Vineyard, South Mesa, 2006. Whew! That's a mouthful. My friend Josh Klapper make this beautiful little wine. What I think is so cool about this project is that it started with Josh and Mark Mendoza, both working at Sona at the time, having the idea to start their own project under the name Timeless Palates. The wine was made at ABC up until this year where Josh is taking the whole thing over and doing all the production work himself. To me, that's exciting! Josh has worked on all sides of the business - retail, somm, wine sales and now he's making wine. I'm partial to the self made! Also, just for the record, the wine is really good. I've had it at a number of tastings and love that the alcohol is so well balanced with the plummy, blue fruits. $23.99 at Mr. Marcel at the Grove.